Telecommuting: Portable computer desk provides desk space anyplace for your telecommute, mobile ework, telework and workteam travel. Telecommuting? Your office space can be anyplace. Portable laptop desk supports your mobile ework, telework, telecommute and project team travel. Have desk space anyplace you office. Telecommuting? Your Office Space Can Be Anyplace. 2 Models both are $129.00. Case not Included.WE SHIP TO APO/FPO ADDRESSES. Portable laptop desks for your telecommuting, mobile telework, ework and frequent workteam travel. Handy desk space anyplace you telecommute. Research Insight - Telecommute With Desk Space Anyplace. Why keep on telecommuting with your laptop on your lap?... as your ework, telework and work teams become more mobile? 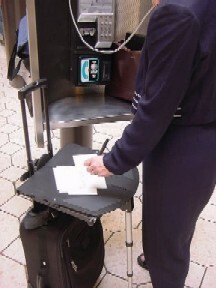 Yes!...add Desk Space AnyplaceTM to your mobile telework and travel gear...it's a unique, compact, portable desk...that quickly converts your rolling luggage, rolling computer case or luggage cart to off-your-lap work space...you can use to telecommute anyplace. Your Mobile Ework � Telework Dilema! Mobile Telework Needs Desk Space Anyplace. Then laptops land on laps... and your telework materials often quickly spread--onto the floor, your luggage, and adjacent chairs...making things more difficult! You begin to worry...that you may drop your laptop...! Where 80 percent of your mobile ework, telework, and telecommuting may soon take place...! What's needed?--Read on to learn how Desk Space AnyplaceTM can give you mobile telework space anytime or place.